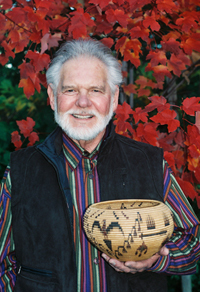 Gene Quintana provides FREE and FAST valuation and identification consultations for fine Native American Indian baskets, basket collections and artifacts, conducted personally and professionally by Gene, known by friends and clients as the "Basket Man." You can entrust your cherished aquisitions and family heirlooms to Gene while he assists with the valuations. As a published collector of baskets himself, Gene brings over 25 years of experience collecting and assisting clients with basket valuations. If you are in need of a basket valuations or identification consultation, please contact Gene at the phone, email or address below.